After Hurricane Sandy swept through the Atlantic coast in 2012, there was significant damage from flooding. A Brooklyn, N.Y., luxury car dealership lost a protective bulkhead and land, and sustained substantial damage to its 2.5-acre asphalt parking lot. A total reconstruction was required. After the storm, stringent regulations for new pavements required the capture of all sheet flow on site for flood-prone areas. This meant a completely asphalted surface for the reconstructed parking lot would not be an option. At the general contractor’s recommendation, Presto Geosystems’ rigid Geopave gravel pavers were proposed. 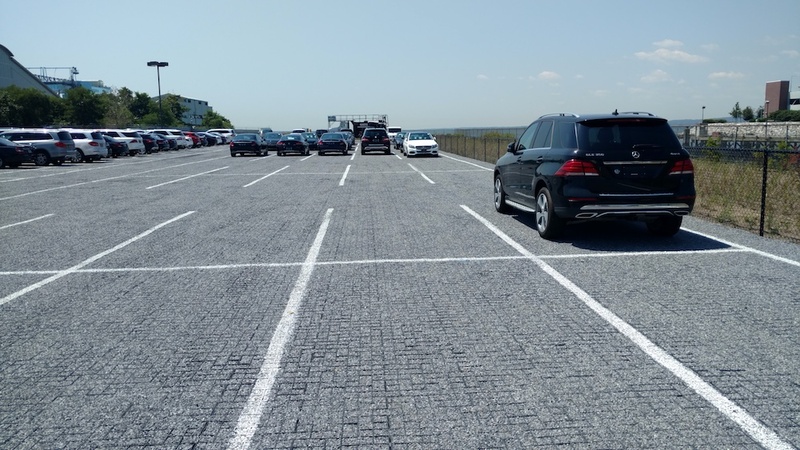 They ultimately met all the regulatory requirements and approvals by the New York Department of Environmental Conservation, and proved to be a feasible solution for half of the parking lot. The porous pavement layer with open-graded aggregate offers fast infiltration, limiting runoff and capturing and storing storm water in the deep base under the pavement for eventual natural percolation. The installed porous pavement aligned with the existing asphalt pavement at the interface of the two pavements. Drive lanes and more than 150 parking spaces (totaling 51,000 sq ft) were installed for the new porous pavement and delineated by white paint lines.